“Unbroken” by Laura Hillenbrand | Grammy's Life . . . So Far!™ Dedicated to the seasons of a woman's life. Unbroken is an unforgettable story. It has been on the New York Times Best Seller list for over three years now. The movie version is coming out at Christmas, but I would urge you to read the book first. I love this story, but I find even more fascinating the story of Laura Hillenbrand. I am amazed that she could write this book. Laura, her fiance and a friend were heading back to college one night more than twenty years ago. Laura was excited that she had found her vintage dress for a college dance and that it was hanging in the car. Earlier in the day, Laura had eaten something that had upset her stomach. When Laura woke up the next morning, she could barely move. She had to drop out of college within three weeks because she couldn’t walk to her classes. She went to live with her mom, but had to have someone come in while her mother worked to care for her. It was several years before a diagnosis of chronic fatigue syndrome was made. Laura has now suffered from CFS for over two decades. There are days, sometimes months, when she can’t get out of bed or take a bath. Her boyfriend, Borden Flanagan, wanted to marry her, and he has been her husband and caretaker since then. Although Laura couldn’t leave the house or even the bed, She knew she could write. The details in her books show that she does extensive research. She has friends who will go do research for her if it is something that she can’t find on the Internet, from other sources at home, or in sources that she has requested to be sent to her home. Her first triumph was the novel Seabiscuit: An American Legend. It topped best seller charts and was made into a movie that was nominated for an Academy Award. After writing Seabiscuit, Laura had a relapse of her chronic fatigue syndrome. For two years she never left her house; for some months she never left her room. While she was so weak, she was calling or emailing people to give her information for the new book she wanted to write about Louis Zamperini. Zamperini told her that there were several books about him, and that there was nothing more to add. Determined to continue with the book, Laura found prison diaries that Louis did not know his fellow prisoners were holding, the fate of the boat that rescued Louis, and many more details that had not been published before. Louis once said that Laura knew him better than he knew himself. They talked over the phone for seven years, but never met. Zamperini wondered about this until he learned of her condition. He then sent her one of his Purple Hearts, telling her that she deserved it more than he did. 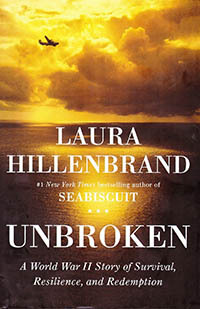 The book Unbroken was released a little over ten years after Laura started writing it. Laura continues to battle her chronic fatigue. There are times when she hasn’t been able to leave her home for two years at a time. But Laura has small triumphs along the way. Recently her husband drove her to the alley at the end of the block so she could see something besides the cemetery behind her yard. A few weeks later, Laura and Borden drove all the way to Starbucks. They went through the drive-through and she stayed in the car. They finished their coffees in the parking lot and then drove home. I am in awe of this woman who suffers so much, and yet she can do detailed research and write incredible stories. It is incredible that someone in so much pain and with so much fatigue can write such researched books and tell the story as she does.